Hubba Bubba, on the other hand, grew up in the northeast, where the babies are basically born cracking crabs and shucking oysters. He orders blue crabs from Maryland about once a year for a big treat, and he goes nuts when we eat at any restaurant that offers a seafood tower. So when my assistant and I wanted to make him a special dinner, we marched ourselves directly over to the fishmonger. (Do not worry, I do not actually use the word “fishmonger” in my daily vernacular. I just wanted to say it because the Barefoot Contessa says it, and my stepmother and I think it’s kind of hilarious.) We picked up some shrimp for boiling, some clams for steaming, and some sole for… well, meuniering. 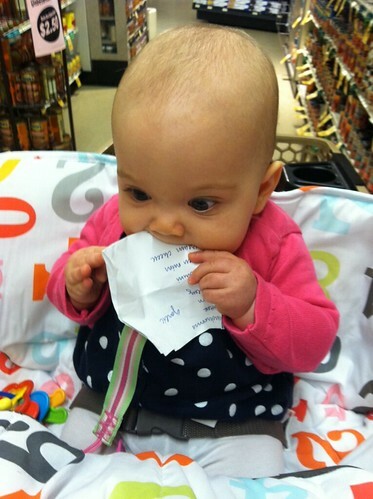 We then headed to the grocery store to tackle the rest of our list, which my assistant insisted on being in charge of… but was subsequently caught eating. *Barefoot Contessa actually calls for the juice of about 3 lemons, plus a teaspoon of grated lemon zest. Personally I think that would be too much, but if you are a big lemon fan, go for it. Preheat oven to the lowest possible setting, and place 2 heatproof plates on the center rack. Combine the flour, salt, and pepper on a plate or shallow bowl. 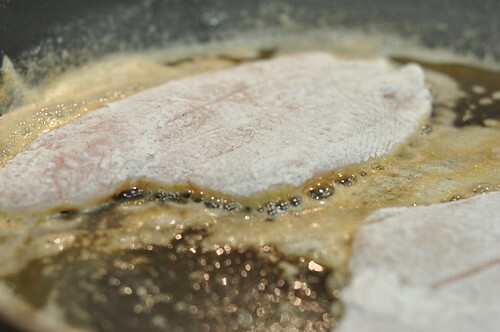 Pat the sole fillets dry with a paper towel. 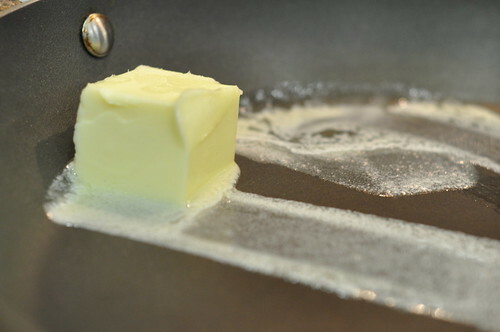 Heat 3 Tbsp butter in a large (12 inch) skillet over medium heat until the butter just begins to brown. 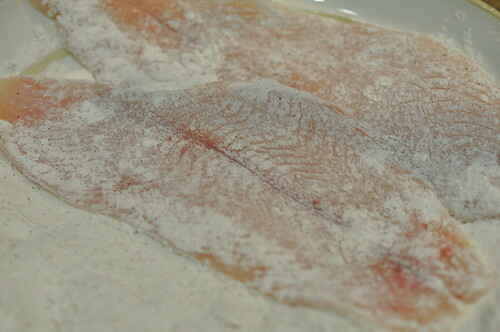 Dredge 2 sole fillets in the flour and place them in the hot butter. Reduce the heat to medium-low, and cook for 2 minutes. Gently turn the fillets over and cook for 2 minutes on the other side. While the second side cooks, squeeze the juice of 1/2 of the lemon into the pan. 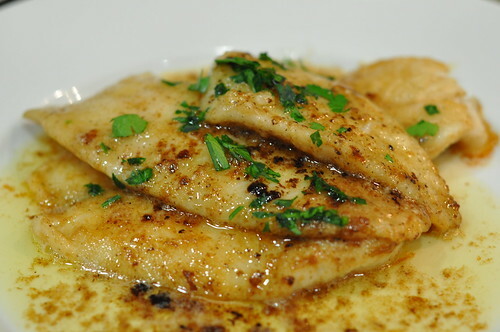 Place the fillets on the plates in the oven, and repeat the process with the remaining 2 fillets. 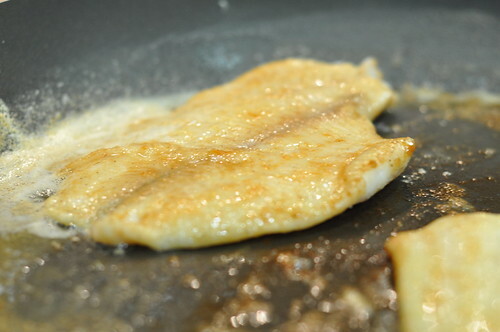 When the second set of fillets are cooked, transfer them to the plates, give the pan sauce a little stir, and pour it over the sole fillets. Sprinkle with parsley and serve immediately. Serves 2. Love it that your assistant is adequately dressed in an oh-so-cute crab ensemble to coordinate with the seafood theme! 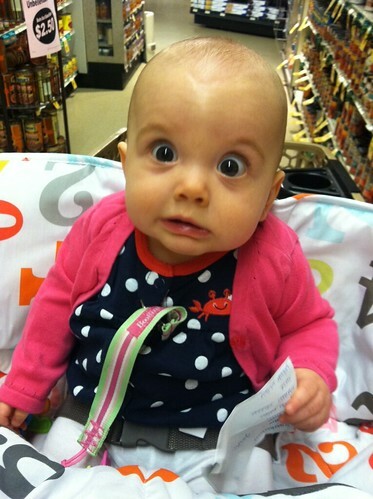 Great recipe…even greater pics of that cutie!